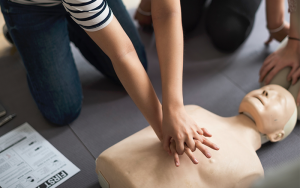 The Morris Community YMCA and Morris Hospital and Healthcare Centers are teaming up this spring to offer Friends and Family CPR classes in Grundy County. Open to area residents, ages 12 and older, these trainings will provide participants with the knowledge, skills and confidence to recognize and provide lifesaving care in a medical emergency until first responders arrive. Please note: This class will be taught in a Friends and Family format. Participants will not earn a CPR certification for completing this class.